Welcome back friends and fellow travelers, to the 2015 Suitcase Series! 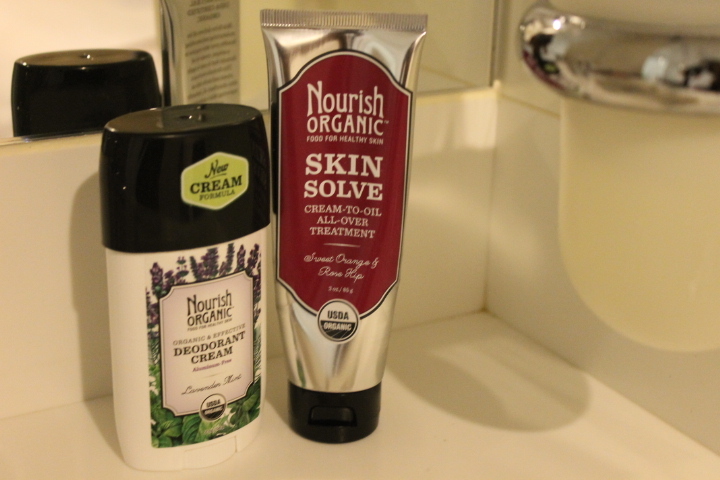 Up next are my October picks; Nourish Organic Skin Solve (Creme-to-oil all-over treatment,) Sweet Orange and Rose Hip scent and Nourish Organic Lavender Mint Deodorant Creme. Find out just how these two remarkable products helped me stay “nourished” during my last big trips. I used both of these products during my time on-board Norwegian Cruise line and was so pleased with them. They fit so well in my cozy cabin, considering I had a limited amount of space, so having smaller sized items worked out splendidly! As I venture out, I encounter so many different climate changes on the road, that I’ve learned that having the right beauty care products can make all the difference. Extensive travel can be brutal on the body at times! Thus, I look for quality items with the best possible ingredients to get me through my assignments away from home. What I love most about this solve, is the smooth and oily texture. It dissolves easily and aids in keeping my skin moisturized. It starts out as a creme, but quickly transforms into an “ultra-absorbent oil” during each application. It’s USDA Certified Organic and is comprised of the following organic ingredients; Shea Butter, Coconut Oil, Sunflower Oil, Jojoba Oil, Cupuaca Butter, Rose Hips Oil, Beeswax, CoCoa Butter, Sweet Orange Essential Oil, Vitamin E, Pumpkin Seed Oil and Palmarosa Oil. It’s also important to note that the solve does include organic soy lecithin, for those who may have a soy allergy. I’m traditionally not a fan of products with soy, but I really like how this solve makes my skin feel after each use. 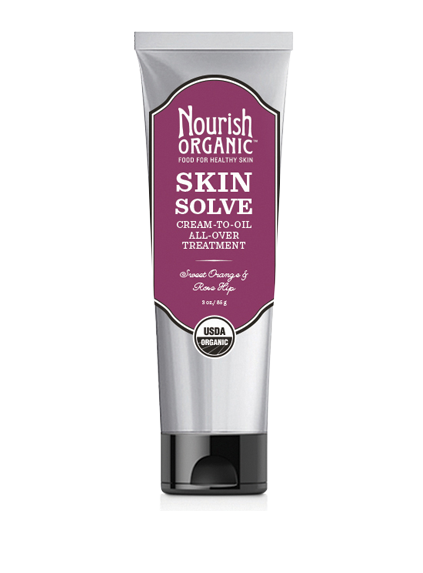 The Nourish Organic Skin Solve comes in a standard 3.oz tube that’s perfect for carry-on as well as checked bags, and also has a soft and pleasant scent that smells as refreshing as it feels. Consider picking up a tube for the current fall and upcoming winter season, to help combat against dry and/or cracked skin as you’re on the move. This deodorant is so light and soft. It feels like butter when you roll it on and offers protection throughout the day. While it comes in a variety of scents, I had the pleasure of testing out the lavender mint. It’s like a cooling agent that won’t dry out the skin. 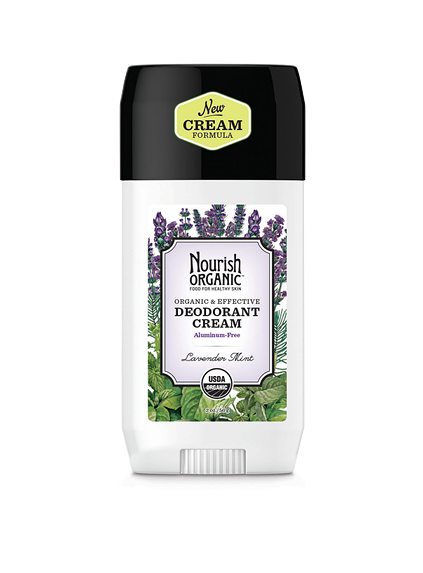 Most importantly, the Nourish Organic Deodorant Creme is aluminum free, which is a huge plus in my book!!! Additionally, the deo includes the following organic ingredients; Corn Starch, Aloe Vera Juice, Alcohol Denat, Shea Butter, Saccharomyces Ferment, Acai Fruit Oil, Rice Bran Extract, Baking Soda, Xanthan Gum, Glycerin, Cupuacu Butter, Sweet Almond Oil, Coconut Oil, Fragrance and Vitamin E. For a more extensive list of ingredient names, please visit nourishorganic.com. I’d also like to note that this product too, includes soy lecithin, for those who have soy allergies or are non-soy product users. This soothing Nourish Organic Creme comes in a 2oz. container that fits comfortably into any suitcase pocket or carry-on bag. Be sure to add to your list for any upcoming adventures.